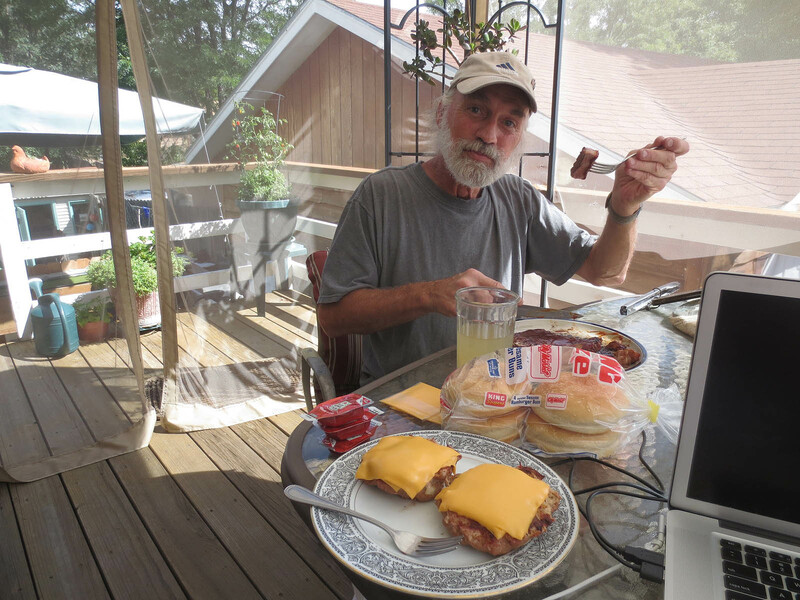 In case you’re wondering, I had turkey cheeseburgers (which Robert cooked to perfection), and yes, that’s my laptop on the right. That’s how committed I am to writing this blog — I was stressing about it while I should’ve been enjoying a leisurely meal — and why I’m constantly tempted to give it up. After we ate, Robert gave me a tour of his place. This was my favorite part . . .
I’ve seen lots of mis-stamped balls over the years, but this one (with the sides missing) was a first. Not only did I assume there wouldn’t be batting practice, but I was cringing at the thought of getting soaked while waiting to enter. See those three players standing together? One of them was Edward Mujica. 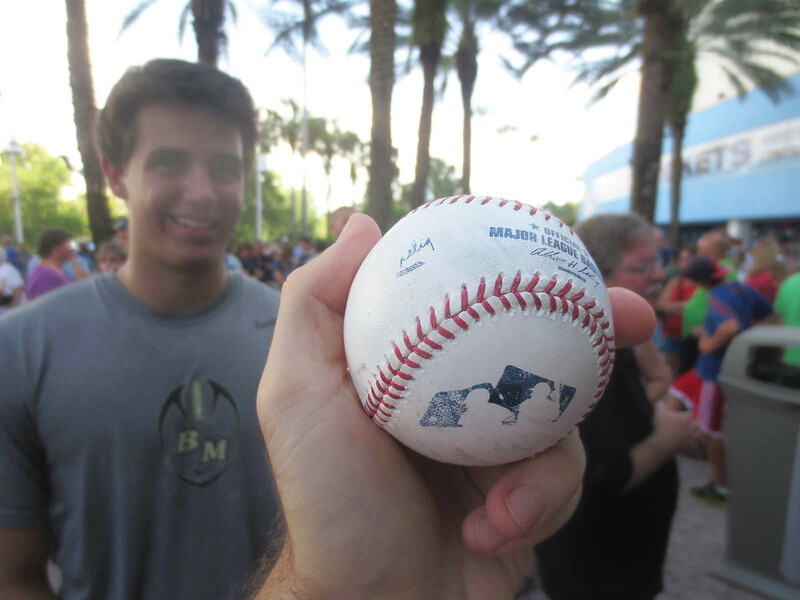 He threw it to me from nearly 100 feet away. My second ball of the day was cheap. I won’t deny it. Jake Westbrook tossed it to a little kid behind me, who dropped it. I picked it up and handed it to him. My third ball should’ve been a ground-rule double, but I completely tanked it. (It had a lot of topspin, okay?!) I felt really stupid and embarrassed about dropping it, but I channeled those toxic emotions and used them to get another chance. 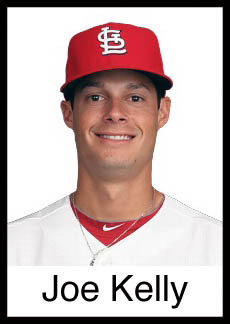 Basically, when Joe Kelly wandered over to retrieve a different ball, I asked him to help me erase the humiliation of my error. “I am totally ashamed,” I told him. “That was bad,” he said, shaking his head. 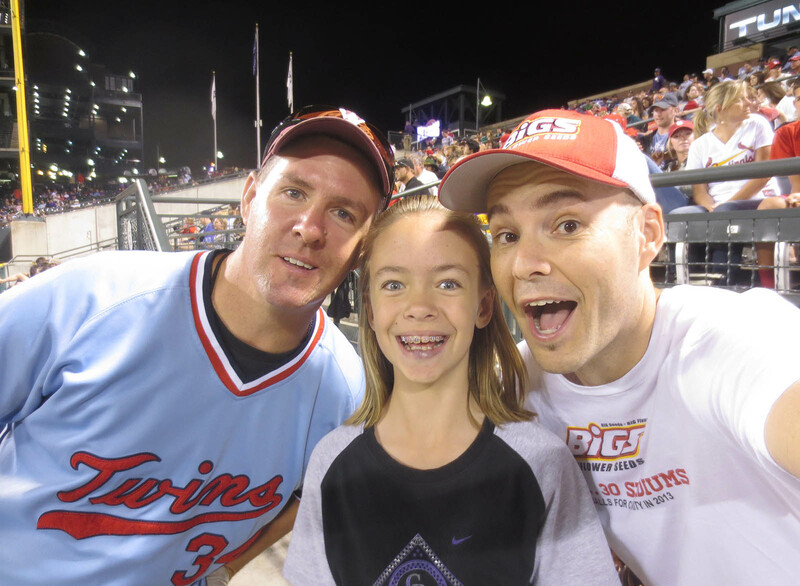 “Alright,” he said, moving several feet back toward the edge of the outfield grass, “let’s see if you can catch this one.” Then he spiked the ball onto the warning track, causing it to bounce up toward me, and yes, I caught it. I thanked him, and he congratulated me sarcastically, and you know what? That was fine. I deserved whatever abuse he felt like giving me. That was it for BP. The Cardinals finished hitting 70 minutes before game time, and I spent the next hour stressing out. 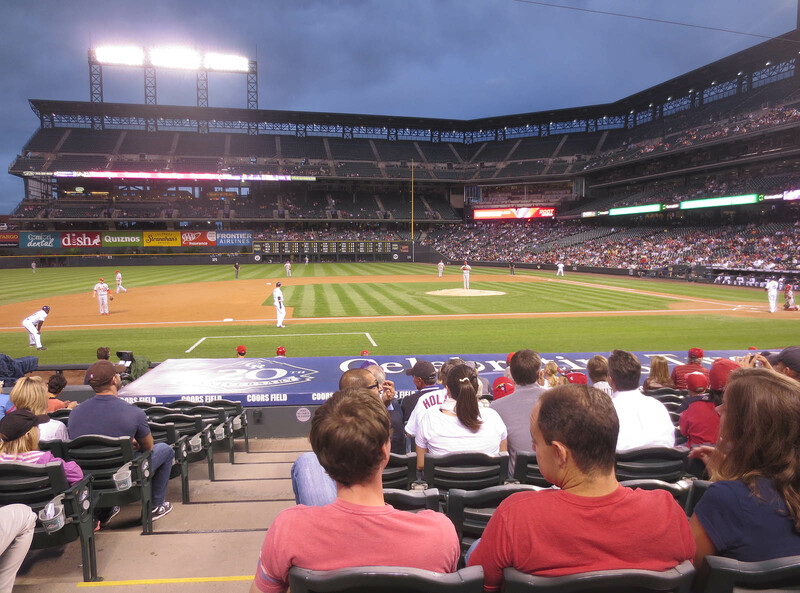 That’s because I’d begun the day with a lifetime total of 96 balls at Coors Field; this was going to be my last game here until who-knows-when, and I really wanted to reach triple digits. 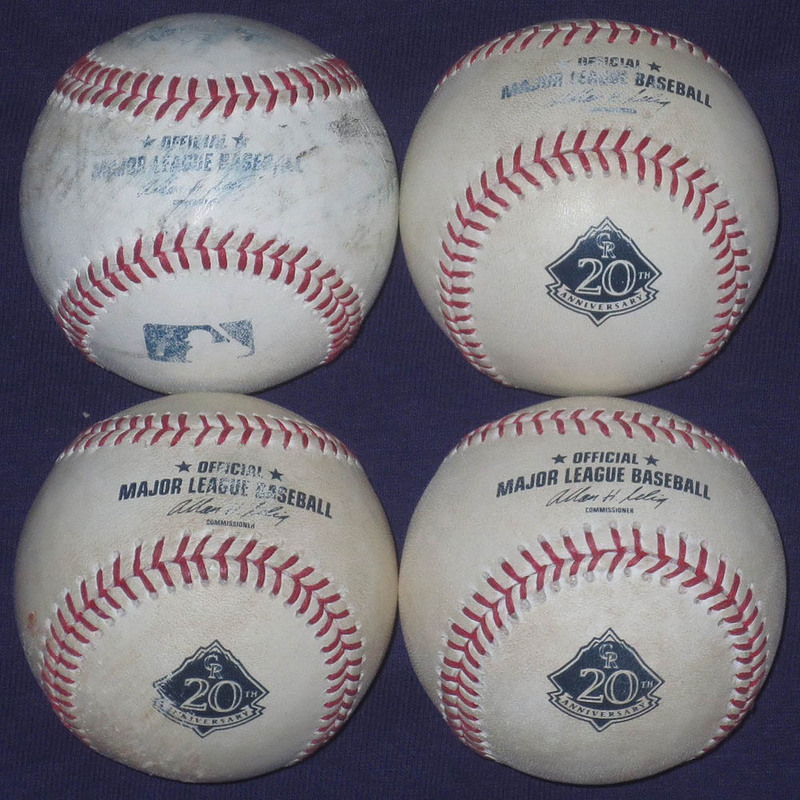 I figured I’d have six or eight or maybe even ten balls by the end of BP, but somehow I only managed to snag three. 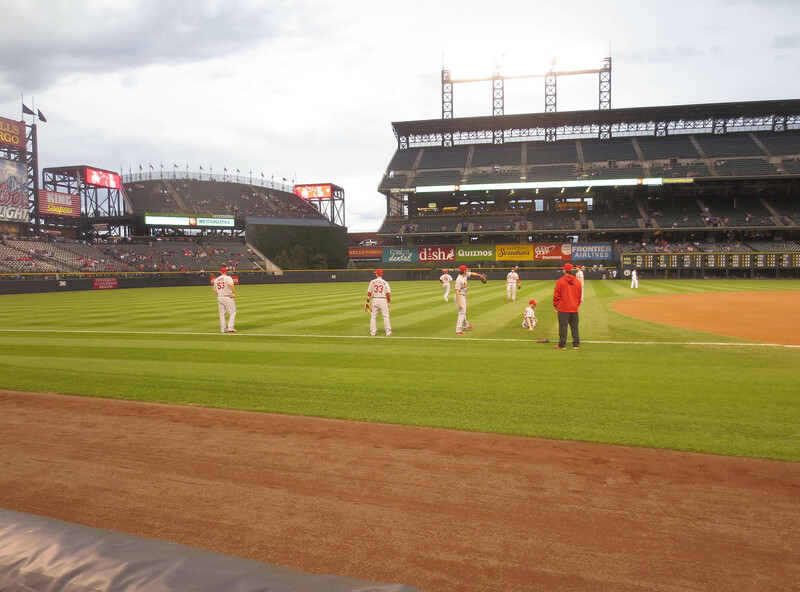 Despite the fact that there were seven players in shallow left field, only one ball got used, and Daniel Descalso ended up tossing it to a little kid on my right. I decided to work the dugouts in the 1st inning on my way out to left field. If I got a 3rd-out ball, great, and if not . 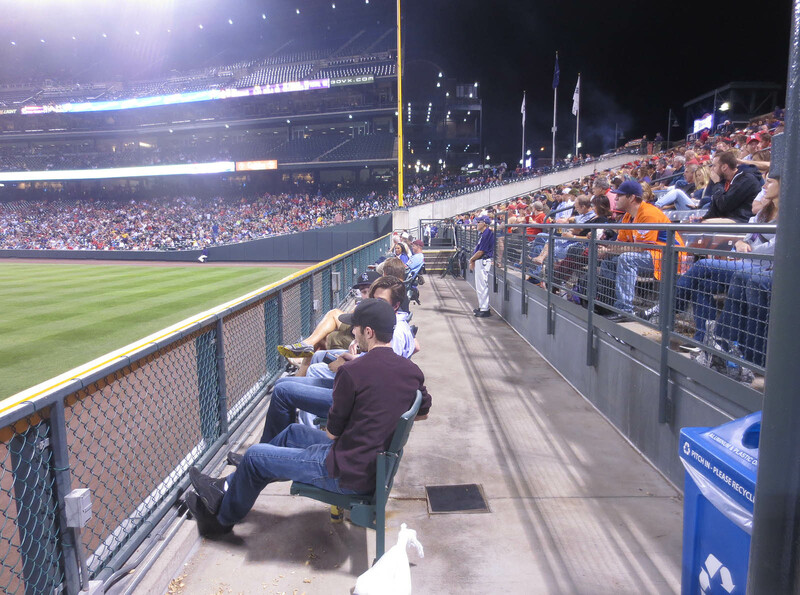 . . well, I wasn’t going to stay in foul territory all night. Maybe I’d go for an umpire ball in the 9th inning, and that would be the end of it. Anyway, this was my view in the top of the 1st . . .
As planned, I headed toward left field in the top of the 2nd. The first people I saw when I entered the section were my good friends Danny and Nettie. Here they are — do they look familiar? 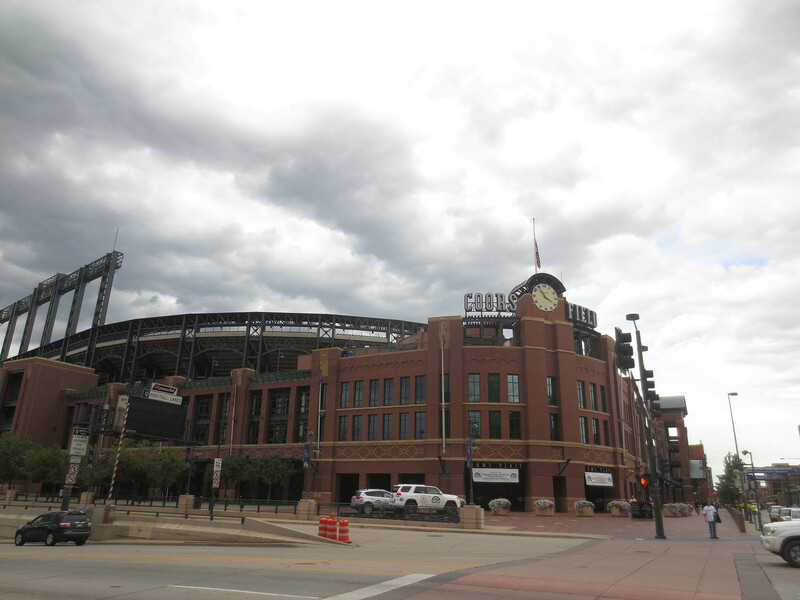 You may recall that I stayed with them the last few times I visited Coors Field. 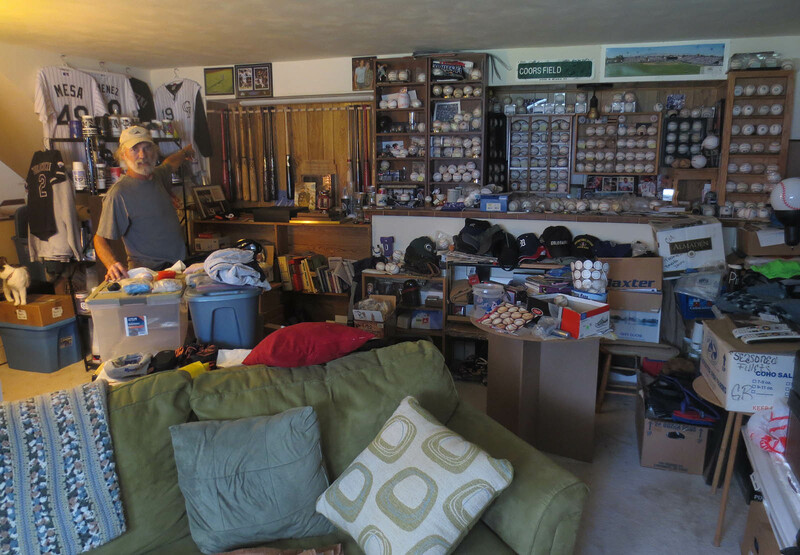 Remember my blog entry from 2008 about Danny’s incredible baseball collection? Well, I’m glad to say that the two balls pictured above are not part of it. That’s right. Those were MY baseballs that he was holding for the photo. I snagged them both in the 1st inning — a 3rd-out ball from Todd Helton in the middle of the 1st and another one three outs later from Matt Adams on the 3rd-base side. BOOYA!!! 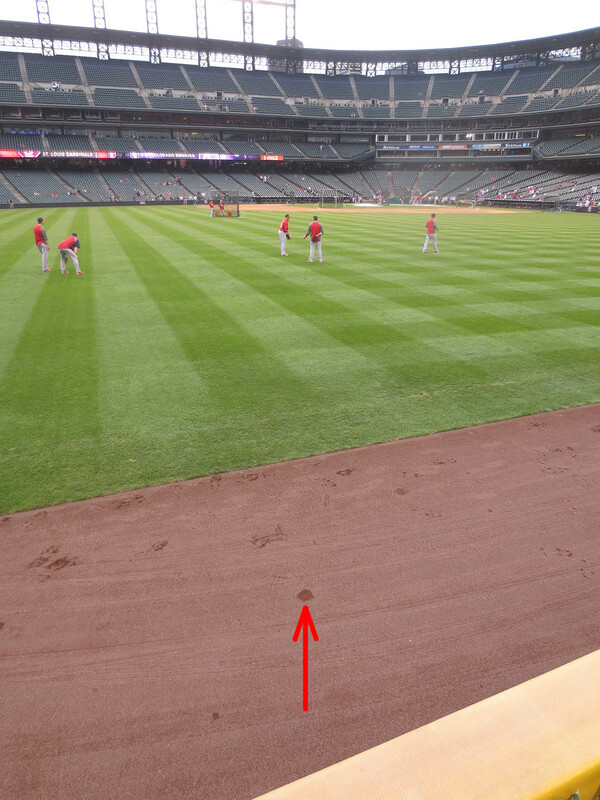 In the top of the 3rd inning, I headed over here . . .
. . . to look for a Daniel Descalso ground-rule double that had bounced into the trees. I did end up spotting the ball, but never made an attempt to snag it. I’m not sure how I would’ve done so — perhaps lingering in the stadium after the final out and asking a groundskeeper to retrieve it? 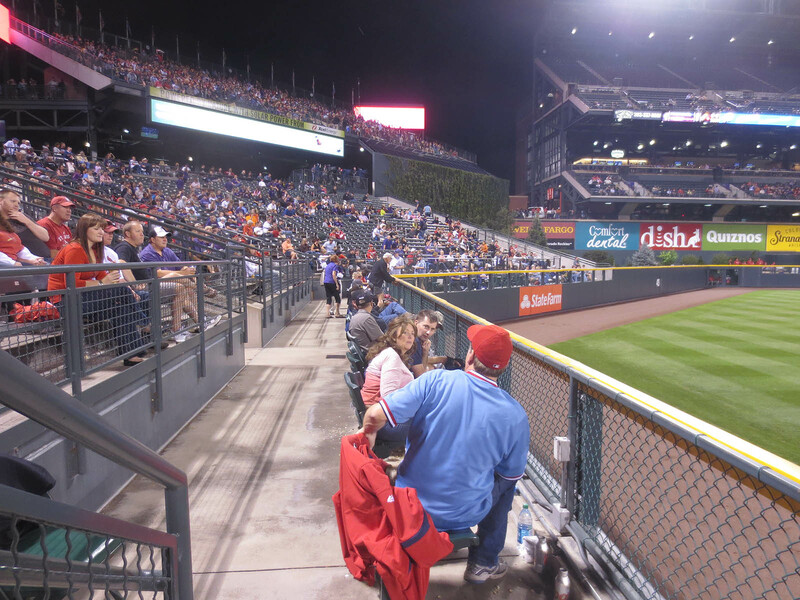 For most of the game, I hung out in left field and had endless room to run. This was the view to my left . . . 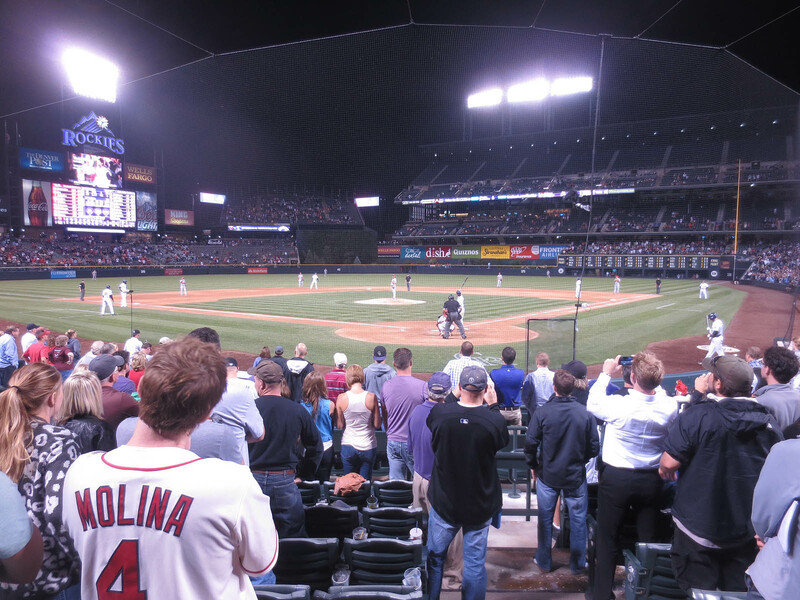 It was home run heaven except for one trivial detail: NO ONE HIT A HOME RUN. 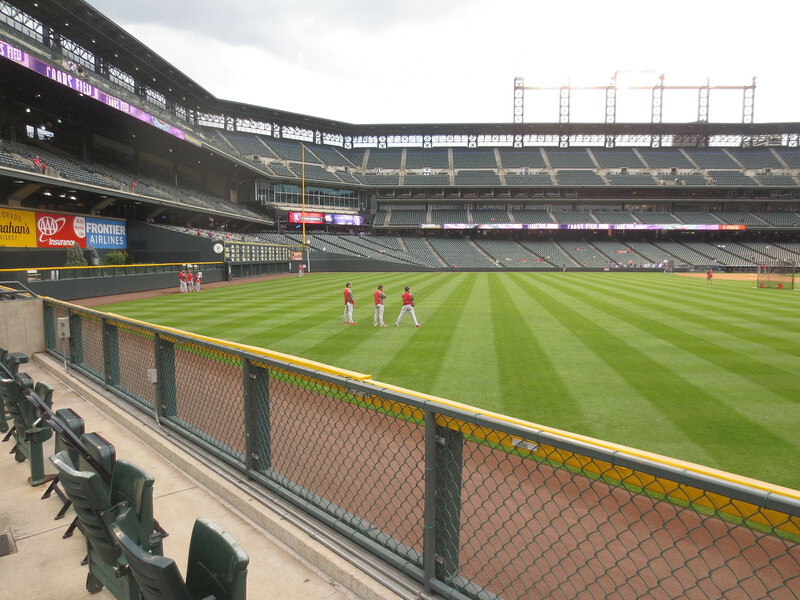 In the three games that I attended at Coors Field, there was a grand total of *one* homer, and it landed in the Rockies’ bullpen. In the photo above, that’s Dan and Emily Sauvageau. 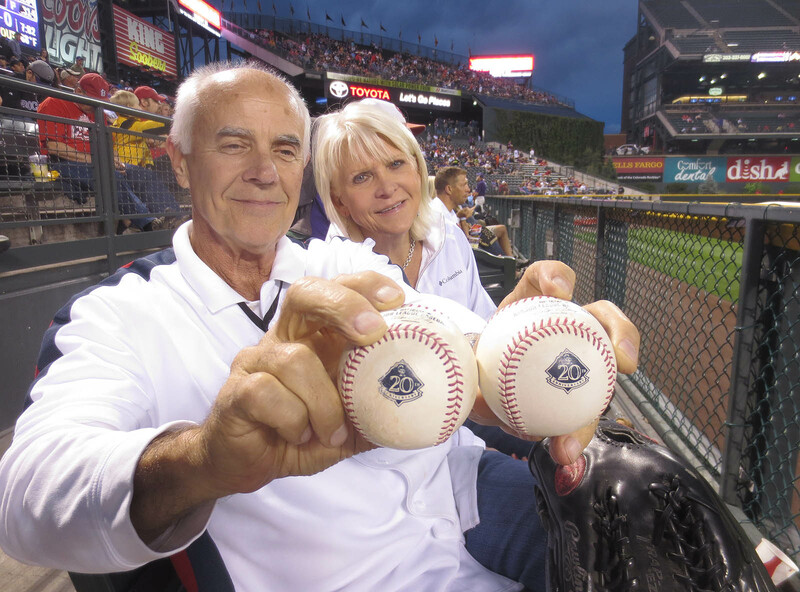 He has snagged 87 home runs — all at Coors Field — and she has attended nearly 500 games with him. As I’ve mentioned in each of my last two entries, I featured him in The Baseball (see pages 287-288) as one of the Top Ten Ballhawks of All Time. 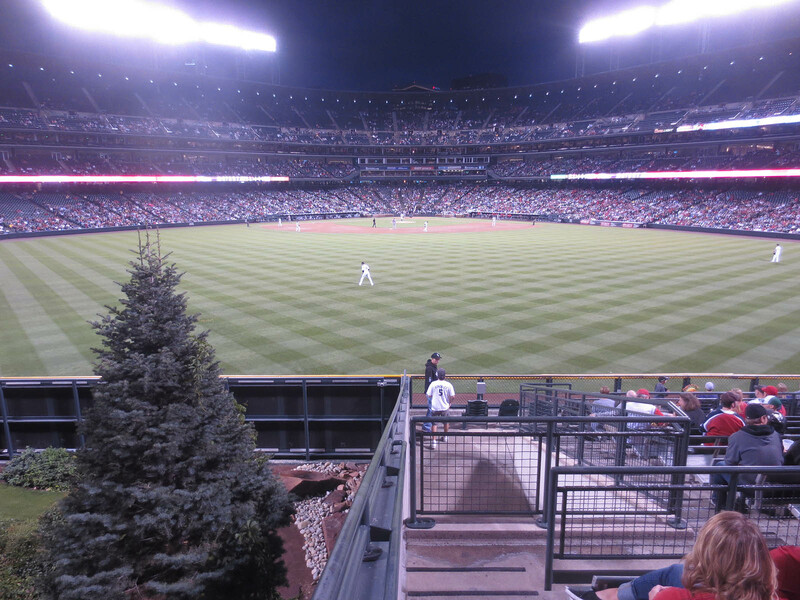 In the bottom of the 9th inning, with the Cardinals clinging to a 4-3 lead, I went here for an umpire ball . 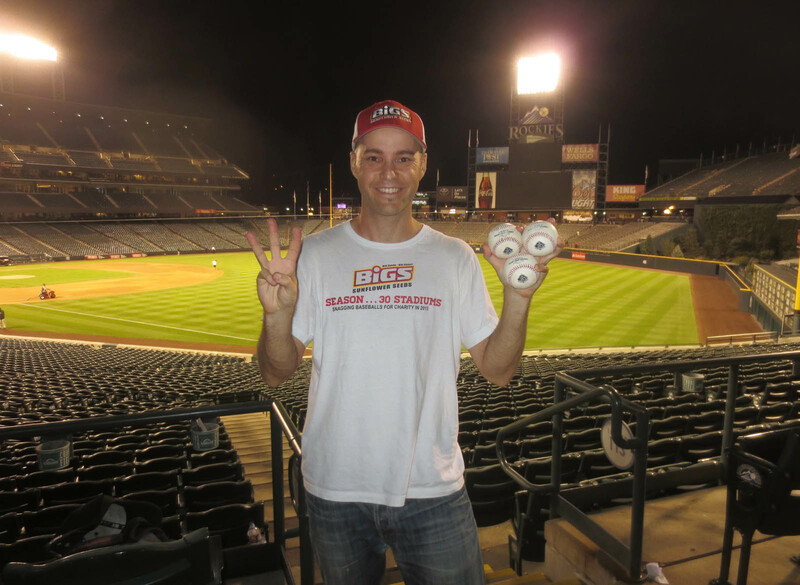 . .
On my way out, Robert photographed me with my three commemorative balls . 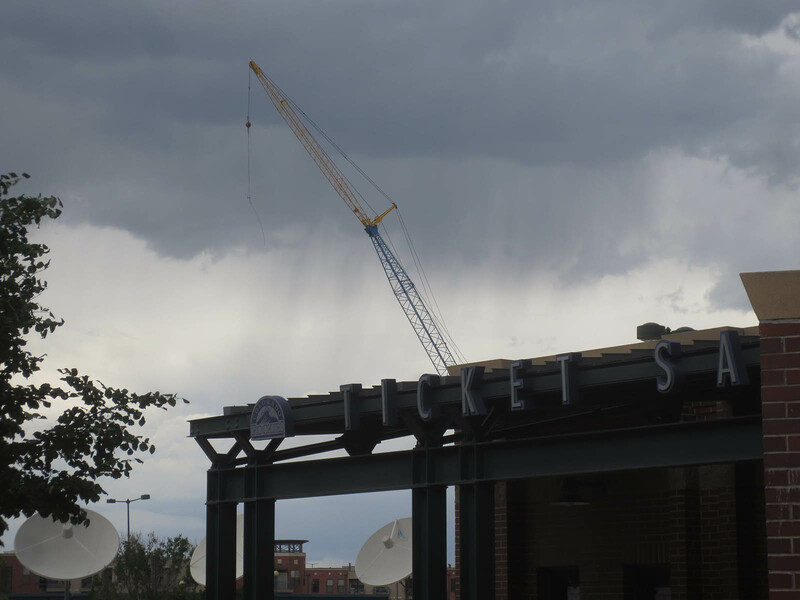 . .
Goodbye, Coors Field. It might be a while ’til I return . . .
• 647 balls in 85 games this season = 7.61 balls per game. 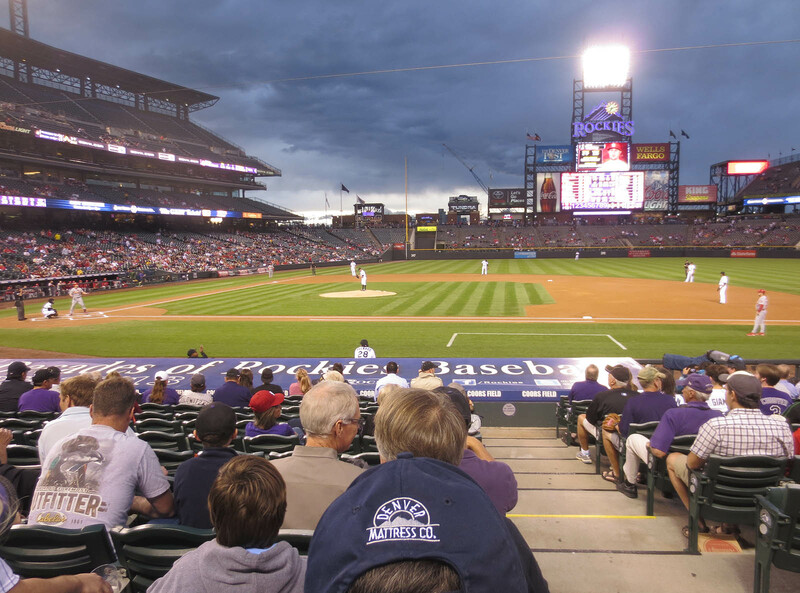 • 102 balls in 18 lifetime games at Coors Field = 5.67 balls per game. What stadium is next in line for 100 balls at #13? Zack- Are you going to be at Citi Field next Thursday (26th) against the Brewers? I won tickets to the Hyundai Club (free food!!!) and I’m going right after school. Give up blogging? Or snagging? Hopefully you won’t give up either. Nice way to finish the ” Adventure ” Zack. Don’t give up blogging!!! Going to Yankee Stadium anytime during this homestand? They’re using Mo balls I heard. Well done, Dan. I really like the Kirby Puckett jersey. Don’t consider giving up blogging. There are a looot of people that wish they were as good as you at ballhawking and enjoy reading your blog and feeling bad about themselves :) But seriously, don’t give it up! Rogers Center — 92 balls. 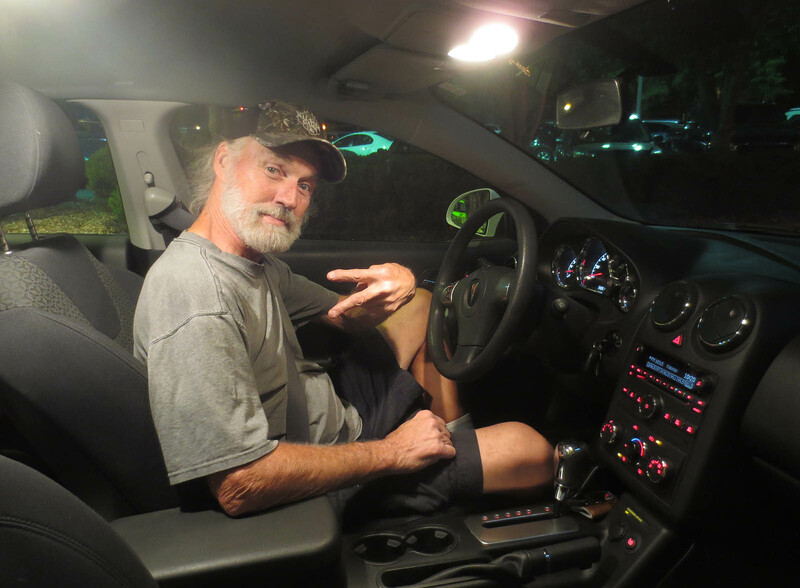 I’ll give up blogging before I giving up snagging. Right now, doing both doesn’t leave much time for anything else. Yes. I’m working on a plan . . .
It’s easy for people to say “keep blogging” when they have absolutely *no* idea how long it takes and what else I have to give up in the process. We’ll see. I feel like I ought to keep blogging through Australia, at least. Australia at least! I’m still hoping Ray Burton will be taking you to a Cricket match! But less selfishly, if it is becoming a “time sink” and not enjoyable, maybe it is time to back off a bit. Like maybe one entry per week/month or something like that. BTW, congrats on the $15,000 for PIFB!! Well done! Those turkey cheeseburgers look delicious. Is that jack cheese ? I understand where you’re coming from about the blogging — I have a hard enough time maintaining my own blog. I’ve been trying to post at least one entry every four days, or so, this year, and have done fairly well so far. But for the most part, I have a decent amount of free time per week, unlike yourself. I can’t even contemplate how difficult it must be for you to keep up your blog, talking about EVERY game, with your hectic schedule. 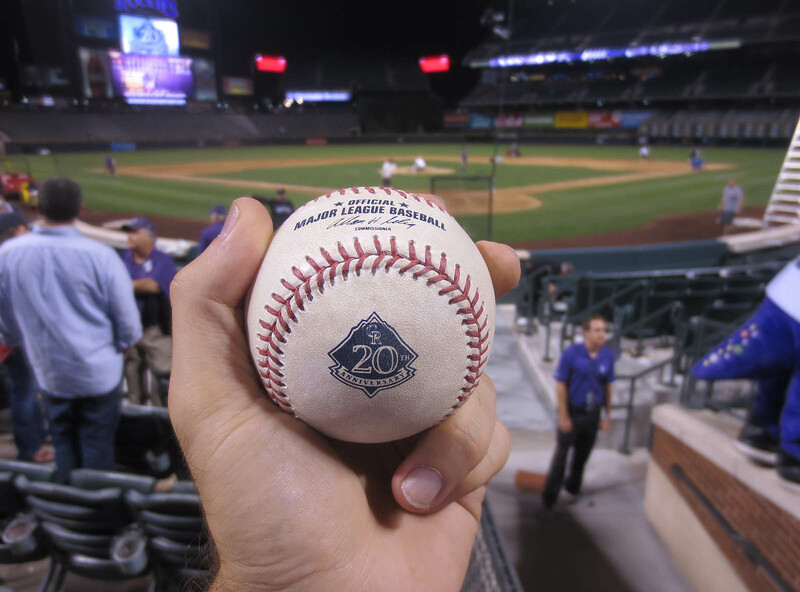 All I can say is, if you can find any way to keep on blogging — perhaps only writing about games in which you snag a game homer, or an especially commemorative ball? — do it. I always enjoy every post. But in the end, you have to do what’s best for you. I’ve thought about blogging less frequently and/or writing shorter entries, but I just can’t get myself to do it . . . yet. I’m still obsessed with documenting everything. Thanks. That’s nice of you to say. I’ll be thinking hard about it this offseason. Nope, just plain/crappy “American cheese,” which is a guilty pleasure for me at times. Many thanks. The problem, though, with only blogging about games in which I snag home runs would be that those are often the longest entries. When I go to Citi or Yankee and only snag four or six balls and get stuck in one stupid section for the entire night, 375 feet from home plate, there’s not much to blog about, which makes blogging easy, but less interesting for people reading it. I’m torn. Big Glove Bob thinks you should dial back the blogging considerably. I have a real idea of all the work that goes into it. A question I always ask myself is “is the juice worth the squeeze?” Would you have gotten the BIGS deal without the blog? Would you have gotten many other opportunities without the blog? It does seem like a great promotion tool, but at what cost? I enjoy the blog, but you don’t owe your readers a dang thing. I would dial it back to just blogging about significant events like the ball drop or milestone balls or games. A blog gets diluted when you blog about every single game. There is a lot to be said about the saying “leave them wanting more”. You need to strike a better balance. I love hearing about the all star, world series, and other special games. I don’t need to read about a mid April Mets vs. Astros tilt in which you snag 11 balls. That is the Dinner Portion’s two cents. Oh poop. I thought I’d have a nice easy night at Citi Field with no kids to compete with, but BAM! Maybe I’ll bring 2 of your books for you to sign. And as for the blog, to be quite honest you were my inspiration to take up ballhawking as a hobby, and now I’m completely hooked to the point where in my dream we were still at home at 5:30 and I told my mom “We’re not going to the game”, even though we had free tickets. Many of the good things that come my way are a direct result of the blog, so in that sense, it would be hard to give up. But I’m glad that you understand. I know I don’t owe anyone anything, but given my position as a leader in this hobby, I often feel that I do. I’m not good at doing things halfway. Either I go ALL IN or I don’t really see the point. Anyway, it was great to see you guys. Wish we could’ve hung out longer. Definitely bring the books, and as for the dream, I can totally relate. Obsession can be a harsh taskmaster.